Dr. Maddalena has had an established dental practice in East Hanover, New Jersey since 1984. A native to the area, Dr. Maddalena attended Fairleigh Dickinson University and then went on to Fairleigh Dickinson Dental School in New Jersey. Dr. Maddalena was a member of Phi Beta Kappa Honor Society and graduated in the top 10% of his class. Both he and Dr. DeFilippis have extensive post graduate studies in all fields of dentistry including: Endodontics (Root Canal Therapy), Cosmetic and Esthetic Dentistry, Pediatric Dentistry, Periodontal Maintance (care of gums and bone around the teeth), Implantology, and Oral Surgery Procedures.Dr. 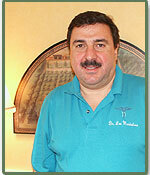 Maddalena lives in the community with his wife Joan and two boys, Louis and Matthew. His hobbies include boating, fishing, traveling and just being with his family. 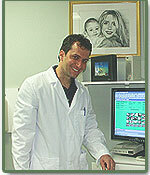 Dr. Don DeFilippis has had an established dental practice in East Hanover, New Jersey since 1990. Born and raised in New Jersey, Dr. DeFilippis attended Rutgers College of Pharmacy and UMDNJ Dental School. An honor student in Pharmacy School and Dental School, Dr. DeFilippis then did his Post Graduate Residency at Morristown Memorial Hospital. Both he and Dr. Maddalena have extensive post graduate studies in all fields of dentistry including: Endodontics (Root Canal Therapy), Cosmetic and Esthetic Dentistry, Pediatric Dentistry, Periodontal Therapy, Implantology, Oral Surgery, and Orthodontics.Dr. DeFilippis is married and has two children. His hobbies include boating, water skiing, playing piano and guitar.